Total War Battles – Shogun: Or, What the hell is this thing? 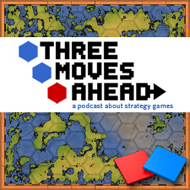 On the podcast, we try not to get too bogged down on genre semantics, but we are generally pretty clear that Three Moves Ahead is about strategy games. Sure, every now and then we deviate just for fun, but we have a mission and it’s clear and that’s what the audience expects. We don’t have a running definition of what a strategy game is, but we know what the ballpark looks like. 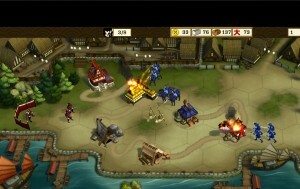 And within strategy gaming, of course, you have a wide range of differentiation. Wargames, base-building RTSes, other RTSes, turn based 4x, continuous-time 4x, tower defense, strategy/rpgs…all fit under the umbrella of strategy but are generally accepted categories. Then Sega throws something like Total War: Battles – Shogun at you and you try to describe it and realize that it fits no strategy category very well. It’s connected to the Total War series, of course; the title alone gives you that. But really the title and setting are the only connection, and the setting is peripheral. 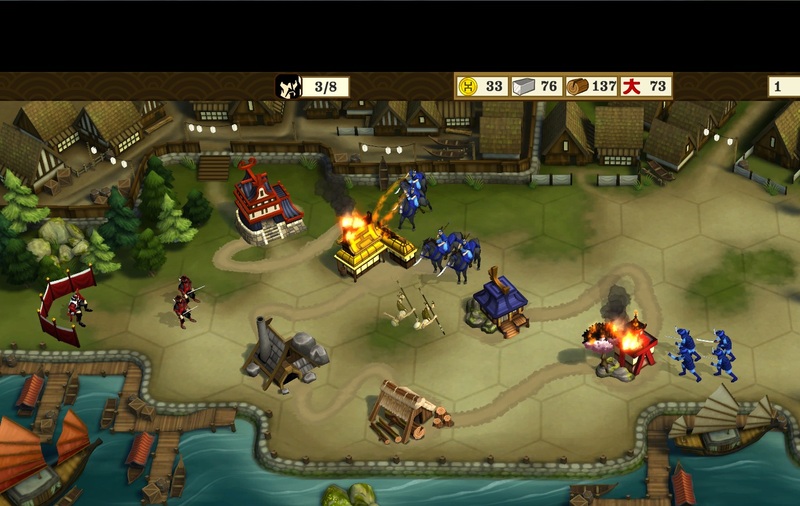 This game has as much to do with feudal Japan as checkers does with becoming a king. It is a weird fusion of tower offense, resource harvesting and geometry. I loved geometry in high school. Geometric proofs were some of the most fun I ever had in a math classroom – everything was so clear and neat. And I have better than average spacial sense. My ex would praise my skills at refrigerator Tetris if we had too many leftovers after a big dinner party – I can find a way to make things fit. But Total War Battles doesn’t make it easy. Every building takes up a certain sized footprint. Other buildings can only function if they are connected to the right buildings. So blacksmiths need to be connected to a trading post. Shrines need to be connected to a lumberjack, but NOT a trading post. And all of this is done with irregular numbers of hexes on a very, very narrow grid – often full of obstacles like ponds and rocks. The structures you can fit on this grid determine how quickly you can gather resources and what kinds of units you can build. This is not easy, and the devs know it. One of the optional missions for gaining extra experience is to fit SEVEN shrines on a sliver of land. Judging where to place each building in succession so you can eventually fit several shrines on this strip is quite a math puzzle. Oh, and in the battle maps you need to figure this out in real time, build soldiers and not die when the enemy shows up. Your control of the forces you build is minimal. They fire on or attack anything in their attack zones (missile only in a straight line, melee anything in the hexes they contact) and can only move forward, in either a straight line or diagnolly, sort of. So you have a base building RTS – with limited tiles to build on – added to a sort of tower offense game since the paths of your units are constrained. The strategy, what there is of it, is about knowing when and where to place your new units so they are countering units that cannot effectively fight back. That adds tiny chess elements, I guess. Whatever Total War Battles is, it’s a mixture quite unlike many games I’ve played. It’s clearly a strategy game, but where it fits in the family tree is an open question. What’s really important, of course, is whether it’s actually a good game, and the jury is out on that. It’s colorful and there is no doubt that the decisions you make matter. The campaign slow ratchets up in difficulty and gives you lots of chances to choose where and how you will spend your experience as you unlock new units, buildings and upgrades. The skirmish maps are more akin to puzzles, which is a nice inverse from the usual RTS formula where the campaign scenarios insist you do things in the right order while skirmish is a free-roam zone. But I can’t really see myself fighting with the math much more. See, fitting those buildings into a confined map is not easy, and even with a tight unit cap, there is an incentive to quickly gather as many resources as you can because the AI is happy to save up its cash and materials and then plop down four units at once in the tiles BEHIND your units; remember, units can only advance. So while your army beat on towers or face cannon they can’t turn back and attack units that are now advancing on your own base. The idea of truly limited space is not one you see often in RTS games from large publishers. You don’t gain territory in Total War Battles, you don’t conquer more hexes on which you can place buildings. You have a building/deployment zone and that’s it. So it is sort of chess like, because the area of play never expands in any meaningful way. Sure, maybe your fresh recruits will be able to advance unscathed a little further once your initial wave has taken out enemy archers. But that’s really it. And losing a building or two is crippling since you now have to build forces to destroy the enemy even as they pummel your structures and take up hexes you want to build on. If any of you have played this weird little game, let me know. Because even as I am frustrated by many of its design choices, I am intrigued that such a melange as this even exists. Yeah, I’m with you, Troy. I got through the second island in the campaign before giving up. For me the deal breaker was never really being sure which of my engaged or blocked units were still set to advance. Having my units suddenly step ahead or switch lanes unexpectedly kept me from feeling like I was in charge of the strategy. I tried the demo on iOS. It didn’t really hook me and I have Civ Rev, Conquest!, GSB and many other games that I really like staring back at me when I want to play a game on the iPad. I almost purchased the PC version when it was on sale last weekend, but decided to go for Falklands War 1982 instead! I’ll sit down and finish the demo version soon and see if the full version (PC or iOS) would be worth it to me. You all should really consider trying out “Plants vs Zombies” one day and then revisit “TW Shogun Battles”? I’ve played a lot of Plants vs Zombies, and yeah, there are some parallels in that both are grid tower defense (to a point). But the geometry of PvZ is much easier, of course. And your defenders don’t have to attack. And as long as you have sun you can keep building any card you have. Buildings get knocked down in TW: Shogun Battles and then you have enemies standing on the single footprint that works for the torn down structure.